1 Day Arrival in Moscow. A local coach and a guide to meet group at the airport. Transfer to the hotel. Sightseeing excursion around Moscow with a view of the most prominent cathedrals and churches (Cathedral of Christ the Savior, St. Barbara's Church, Church of the Trinity in Nikitniki, Church of the Resurrection, etc.) 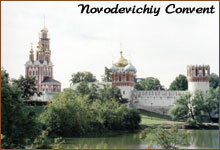 Visit to the Novodevichiy Convent. Return to the hotel, dinner at the hotel. 2 Day Breakfast at the hotel. A local coach and the guide for a visit to the kernel of the city - the Kremlin and Cathedrals: Assumption, Annunciation, Archangel Cathedrals, Church of Twelve Apostles, Church of the Robe Deposition and Ivan the Great Bell Tower. A visit to St. Basil's Cathedral that has become the ultimate symbol of Russia. Return to the hotel, dinner at the hotel. 3 Day Breakfast at the hotel. A local coach and a guide for a whole-day sightseeing: Excursion to Sergiev Posad (former Zagorsk), a visit to Trinity-Sergius Monastery (Troitse-Sergieva Lavra) and Cathedrals: the Trinity Cathedral, church of the Saint Spirit, Annunciation Cathedral, Chapel at the Well. A visit to Theological Academy and Iconography School of Sergiev Posad. A visit to Tchernigov- Gevsimansky Skit. A visit to Khotkovo, Convent of Intercession. Transfer to Moscow. Return to the hotel, dinner at the hotel. 4 Day Breakfast at the hotel. A local coach and a guide for a whole-day sightseeing: A visit to Tretiakov Gallery that houses the world's best collection of Russian icons. A visit to Danilov Monastery (on occasion - meeting with an exponent of the Orthodox Church). Return to the hotel. Dinner at the hotel. 5 Day Breakfast at the hotel. A local coach and a guide for a whole-day sightseeing: A visit to Zvenigorod - Savvino-Storozhevsky monastery. A visit to Andrey Rublyov Museum of Early Russian Culture & Art (icon museum) in Andronikov Monastery. Return to the hotel. Dinner at the hotel. 6 Day Breakfast at the hotel. Transfer to the airport. Departure.